Where does the Tokaido Shinkansen stop in Tokyo? I'm planning on taking the Nozomi category of the Tokaido shinkansen from Osaka to Tokyo. I'm trying to figure out where exactly in Tokyo it stops. As best I can tell from Googling it stops in Tokyo Station, but I haven't been able to get definitive confirmation of that and I know that Tokyo has a lot of train stations. Can someone please confirm this? For Tokaido Shinkansen, Shinagawa station and Tokyo station are the two only stations in Tokyo. You might comfirm this from the offical timetable. Tokaido Shinkansen trains stops at Tokyo Station (東京駅) in Chiyoda and Shinagawa Station (品川駅) in Minato. Both stations are accessible by the major urban JR line of Tokyo, the Yamanote Line; Tokyo Station is also accessible by the Marunochi Line of the Tokyo Metro. Also, both stations have direct JR train service to NRT. The JR East Narita Express Line is a limited express service from Omiya Station/Ofuna Station to NRT (Narita Airport Terminal 1 and Terminal 2/3 stations) - the cost is 3,020 yen from Tokyo to NRT and 3,190 yen from Shinagawa to NRT, but it is covered by a JR Pass if you own one. Please note, however, that Narita Express is a limited express, and all seats are reserved. You may do so online, or at a Midori-no-madoguchi (みどりの窓口) "green" ticket office at the Narita station. Alternatively, you may take the rapid service train, Aiport Narita, which also serves the same route. It is slower (80-90 mins) than the limited express, but it is much cheaper: 1,490 yen from Shinagawa, 1,320 yen from Tokyo. Airport Narita is just an extended Sobu Express rapid service train, and no reservations will need to be made. However, if you take a JR train, be careful which train you board! Make sure the destination of the train is Narita Airport Terminal 1 Station (Narita-kuko-eki yuki) You may also want to study the time table. If you are at Shinagawa, you also have an extra option of taking a Keisei Electric Railway train. Although the Keisei Main Line doesn't go to Shinagawa, they operate a through service onto the Keikyu Main Line through the Toei Asakusa Line; Shinagawa Station is on the Keikyu Main Line. Thus, you could take a Keisei Main Line train if you go to the Keikyu part of the station. This will cost you 1,502 yen and around 80-90 minutes, so it's quite similar to the Sobu Express Airport Narita service in all respects. However, direct Keikyu trains from Shinagawa Sta. to NRT are infrequent; you may want to use the travel planner on Keisei's website to plan your travel ahead of time (scroll down; it's at the bottom left). disembark at Tokyo and take the Narita Express. I recommend the first; it's much cheaper. However, if you happen to have a JR Pass or don't have much time, take the second option. Tokaido Shinkansen stops at Tokyo and Shinagawa stations. It also stops at Shin Yokohama station which is in Kanagawa prefecture, but very close to lots area of Tokyo. If you are going to Narita, then Tokyo station definitely. Tokyo - Narita by Narita Express is less than a hour. Furthermore if you want to travel cheaper and don't mind the extra 30 ~ 60 minutes (depending on the traffic), you can use the bus. For that you should go to Osaki (大崎) station which is 3 mins away from Shinagawa (品川) station. There you can take the bus. 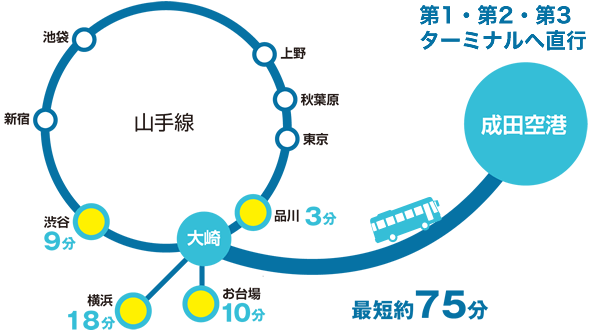 It will take you around 75 minutes (minimum) from Osaki to Narita (成田空港). Not the answer you're looking for? Browse other questions tagged japan tokyo japan-rail shinkansen or ask your own question. Does the JR East pass cover my route? Can I converse with Japanese travellers on the Shinkansen or is it rude? How can I find out what type of train is used for a Shinkansen service? Miraikan visit and luggage storage possibility in Tokyo Shinkansen station? Where to find vintage electronics in Tokyo? What does my Shinkansen ticket say?